Reginald Harrop worked in the British Royal Air Force during WWII as a bomb aimer and flight instructor. Reginald Harrop woke up, confused. He was on a large cruise ship that should have been heading off across the Atlantic, with a convoy of 10-20 ships. But when he looked outside, they were alone, and the Rock of Gibraltar was towering over him. After making it past the Germans, they crossed the Mediterranean into Alexandria and Cairo. 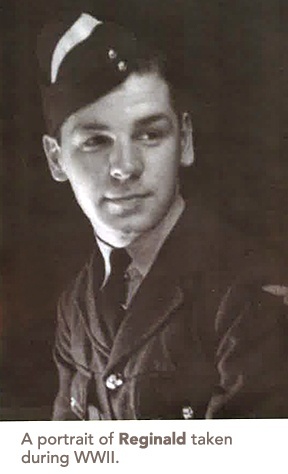 Born in Yorkshire, England in 1923, Reginald joined the British Royale Air Force when he was 18 years old. He had a strong desire to help with the war effort, and wanted to work on aircrafts. However, he was a year too young, and when the air force discovered this, they made him quit. Reginald returned to civilian life and his tailoring apprenticeship. He made suits and garments for ladies and men. In June 1942, a year after being discharged from the air force, he reapplied and was accepted. He spent most of his time in Cumberland, England, teaching Canadian pilots how to aim bombs. He was also in Tel Aviv, Israel, and was in different parts of South Africa. When the war ended in 1945, Reginald went back to tailoring for a short while before once again joining the air force so he could return to South Africa. He stayed on with the air force for another four years, before meeting his future wife, Dorothy. They met in London at a mutual friend’s wedding, and were married themselves in 1949. Reginald left the air force in 1950, and in 1951 the couple immigrated to Canada. Reginald already had a sister living in Canada. She’d married a Canadian during the war and come over to meet up with him, taking the Queen Mary across the Atlantic and settling in Winnipeg, MB. Reginald and Dorothy spent some time with her before moving on to Vancouver, BC. Once there, Reginald, having had enough of tailoring, worked in a machine shop for 27 years. They went back to England with their two daughters, Vicky and Debbie, every two years for vacation, and enjoyed touring around Canada as well. Today, 94-year-old Reginald lives at Mayfair Terrace Retirement Residence in Port Coquitlam where he enjoys meeting new friends.